Strawberries don’t have to be part of a dessert – most berries work brilliantly in savoury dishes too. 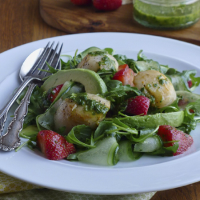 Since scallops are also sweet they pair well with bitter rocket and creamy avocado in this recipe for a summer salad. 1. In a small food processor blend all the dressing ingredients together. Set aside. 2. Warm a frying pan over a medium heat and melt the ghee. Cook the scallops for 1-2 minutes on each side, until the surface is slightly caramelised. The scallops will remain slightly under-cooked in the middle, to prevent them from going tough. Drain the scallops on kitchen toweling, then season with a pinch of salt, pepper and a squeeze of lime juice. 3. Toss all the salad ingredients together with 1 tablespoon of the dressing till the rocket is lightly coated. Plate up and top the salad with the cooked scallops and a further 1-2 tablespoons of dressing.